During the evenings of 11/30/17 and 12/01/17, 8:00PM to 5:00AM, temporary traffic holds of northbound Avenue E at 52nd Street and Toll Plaza traffic entering the Turnpike will be utilized to erect new sign structures. This work will be supported by State and Bayonne Police. · New roadway construction continues on the west side and east side of Avenue E, from 52nd Street to 51st Street. · A new work zone was created in the Toll Plaza area in support of new sign structure work. New roadway construction continues on the west side of Avenue E, from 52nd Street to 51st Street. A new work zone was created in the Toll Plaza area in support of new sign structure work. On Monday, 11/13/17, traffic from Port Jersey Boulevard to the Toll Plaza will shift onto the new westbound Connector Bridge. A work zone will be created in the Toll Plaza area, including the closure of Toll Lane 6 (exiting the Turnpike) to facilitate sign structure work. This work zone will be in place for approximately four (4) weeks. Please CLICK HERE for graphic. A new work zone was created on the west side of Avenue E, from 52nd Street to 51st Street, for new roadway construction. On Monday, 11/13/17, traffic from Port Jersey Boulevard to the Toll Plaza will shift onto the new westbound Connector Bridge. During the weekend of 11/10/17, weekend lane closures on northbound and southbound Route 440, between Pulaski Street and Harbor Drive, will be implemented. Westbound Pulaski Street to Route 440 will also be temporarily detoured onto Chosin Few Way. These closures and detours are required for asphalt paving on Route 440. Work will be supported by Bayonne Police. Please CLICK HERE for graphic. During the weekend of 11/10/17, 8:00PM Friday through 4:00AM Monday, traffic on northbound and southbound Route 440, between Pulaski Street and Harbor Drive, will be reduced to a single travel lane in each direction. The southbound Route 440 Jughandle to Pulaski Street will be closed and traffic will be detoured south onto Prospect Street. 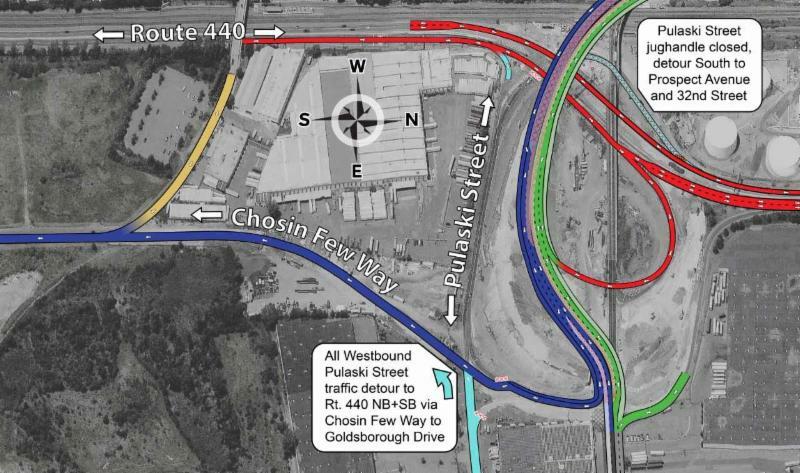 Westbound Pulaski Street to Route 440 will also be temporarily detoured onto (new) Chosin Few Way. These closures and detours are required for asphalt paving on Route 440 in the vicinity of Pulaski Street. Work will be supported by Bayonne Police. Please review the following graphic for details or CLICK HERE. On Monday, 11/13/17, traffic from Port Jersey Boulevard to the Toll Plaza will shift onto the new westbound Connector Bridge in a single travel lane. A work zone will be created in the Toll Plaza area, including the closure of Toll Lane 6 (exiting the Turnpike) to facilitate sign structure work. This work zone will be in place for approximately four (4) weeks. Please review the following graphic for details or CLICK HERE. 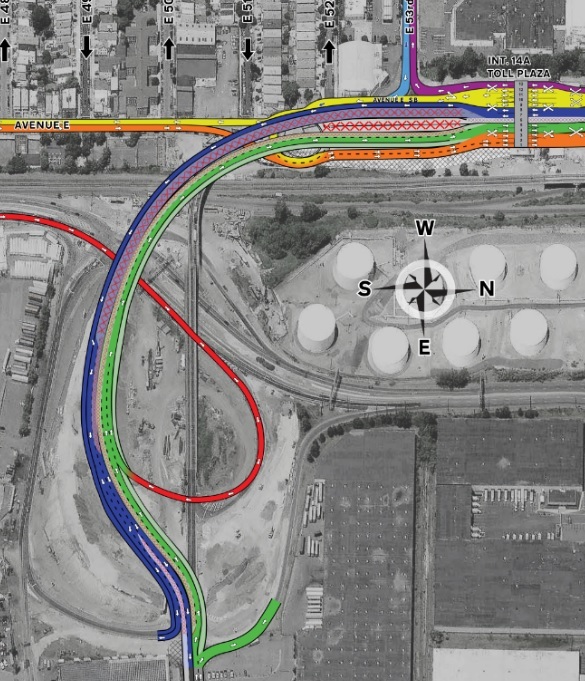 During the week of 11/13/17, traffic from Port Jersey Boulevard to the Toll Plaza will shift onto the new westbound Connector Bridge. A work zone will be created in the Toll Plaza area, including the closure of Toll Lane 6 (exiting the Turnpike) to facilitate sign structure work. This work zone will be in place for approximately four (4) weeks. On Sunday, 11/05/17, NJ Transit Light Rail Service between the 34th Street Station in Bayonne and the Danforth Avenue Station in Jersey City will be maintained via NJ Transit bus service, 6:00AM Sunday morning through 7:00PM Sunday evening. During this period, bridge construction work will be performed over the NJ Transit and Conrail train tracks. Please CLICK HERE for more information. During the weekend of 11/10/17, weekend lane closures on northbound and southbound Route 440, between Pulaski Street and Harbor Drive, will be implemented. Westbound Pulaski Street to Route 440 will also be temporarily detoured onto Chosin Few Way. These closures and detours are required for asphalt paving on Route 440. Work will be supported by Bayonne Police. Please see the following graphic for details. On Sunday, 11/05/17, NJ Transit Light Rail Service – between the 34th Street Station in Bayonne and the Danforth Avenue Station in Jersey City – will be maintained via NJ Transit bus service, 6:00AM Sunday morning through 7:00PM Sunday evening. During this period, bridge construction work will be performed over the NJ Transit and Conrail train tracks.